Saturday 19th May saw the 2018 Maver Match This qualifier campaign return to Partridge Lakes in Culcheth, Warrington for this nineth and latest qualifier event. 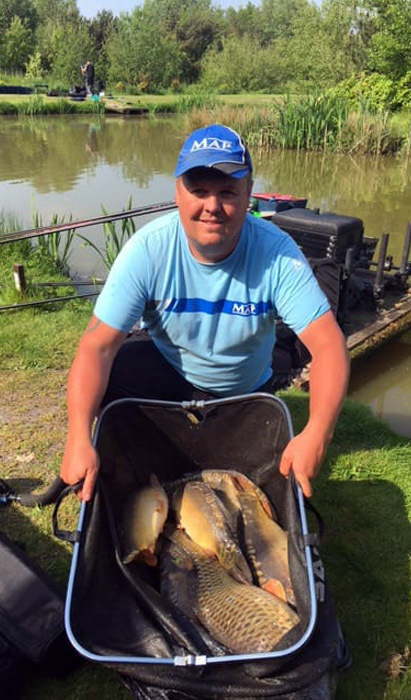 Ninety eight (98) hopefuls lined the banks of Spey, Covey 1, Covey 2, Covey, Covey 4, Covey 5 and Covey 6 for their chance to qualify for this year’s Grand Final at Maver Hayfield Lakes on September 1st. This latest qualifier was never going to be a big weight match with temperatures in the low to mid-twenties, cloudless skies and little or no breeze. However, that said, conditions on the day made for a level playing field. It was very much a case of who could mug the biggest and most fish. There are not many anglers who can boast the same record as Jamie’s when it comes to qualification for Maver Match This finals! Winner on the day, and making his way through to another Mega Match This final was the ever-consistent, Jamie Hughes (MAP). Jamie drew fancied peg 72 on Covey 3 and opted to fish meat shallow from the off to enjoy a superb first ninety (90) minutes of the match admitting to around 60lbs of carp up to 12lbs. However, as the day wore on and the sun got higher, Jamie’s catch rate declined until a slight breeze picked up late on in the match, which saw Jamie snag a few more fish before the all out. Jamie ended the day with 101-05-00 of carp, all caught on meat up in the water, to qualify for this year’s final. Having made the podium twice in previous finals, Jamie will be more determined than ever to add ‘Match This Champion’ to his already impressive CV. Finishing in second place, and qualifying for August’s British Pole Chamionship final, was James Howarth (Tri-Cast / Spotted Fin). James drew peg 42 on Covey 2 and, like Jamie, caught well from the off mugging carp cruising in the upper layers. As the match progressed, James then came short on his ‘mud line’ fishing maggots and micro pellets to find F1’s in numbers to end the day with 92-11-00 to narrowly see off the challenge from Stephen Openshaw. Steve secured an overall lake win from peg 137 on Covey 6 to finish in third place. Steve opted to fish maggot shallow for most of the match to 92-08-00 of F1’s.